Briquetting presses of the BrikStar CM series are designed for the highly reliable and fully automatic briquetting of lightweight metals. 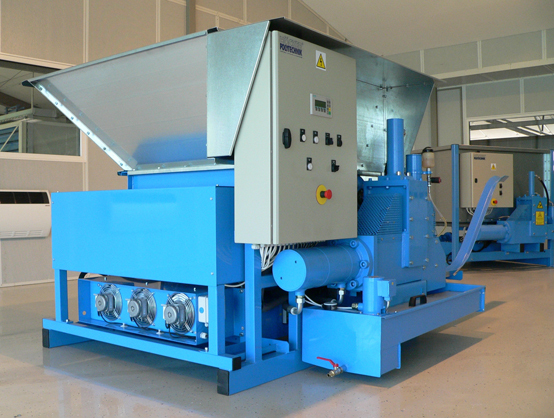 A BrikStar CM handles aluminium and magnesium chips as well as dusts or granules from a wide range of materials. The machine is ideal for retrofitting under a cyclone separator or dust collector; it can be integrated into an existing installation. Manual loading is possible using a chain conveyor or a bin lifter. The design concept of the compact BrikStar CM series is based on a solid frame, a hopper, screw feeders driven by gear motor, and an integrated hydraulic unit. Each BrikStar CM has a small footprint, high operational reliability and a superior cost-benefit ratio. The recovery of CCFs for recycling and re-use and the possibility of briquette sale are not only environment friendly but allow as well a short amortisation of the investment.